The Good Earth… | Only at His Feet! Mark 4:8 (ESV) And other seeds fell into good soil and produced grain, growing up and increasing and yielding thirtyfold and sixtyfold and a hundredfold. 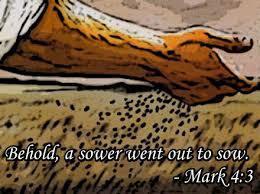 Mark 4:20 (ESV) But those that were sown on the good soil are the ones who hear the word and accept it and bear fruit, thirtyfold and sixtyfold and a hundredfold. Good soil… When a seed is planted in good soil, when it receives water – food – sun, it will grow and become the tree it was intended to become. But did you know that not all seeds can grow in the same type of soil. Some need soil dark and black and full of nutrients, others need sandy soil high in alkaline. There are some trees that can only grow in rainforests and others that need the arid landscape of a desert. It just depends. Humans are also that way when it comes to growth in a relationship with Jesus. One type of study may work with one person while it won’t with another. Pentecostal preaching may turn some people off whereas it excites another to follow God in a greater way. We’re all different. The most important information to remember is that Jesus is the center of it all. You can disagree on minute points BUT the fact that Jesus is the door, the way and the life is non-negotiable. By placing ourselves in good soil, by putting Jesus as the priority in our life we will bear fruit. Much fruit as the scriptures state. It is a matter of making sure that we as individuals love the Lord with all our heart, our minds, and our souls. Jesus is the vine from which we grow and bear fruit! Let’s not forget that!